It's the last day of our trip (can't believe time just flew by!) and we woke up to an amazing sight. IT WAS SNOWING! The girl and I were so excited that we ran outside after breakfast to check it out! 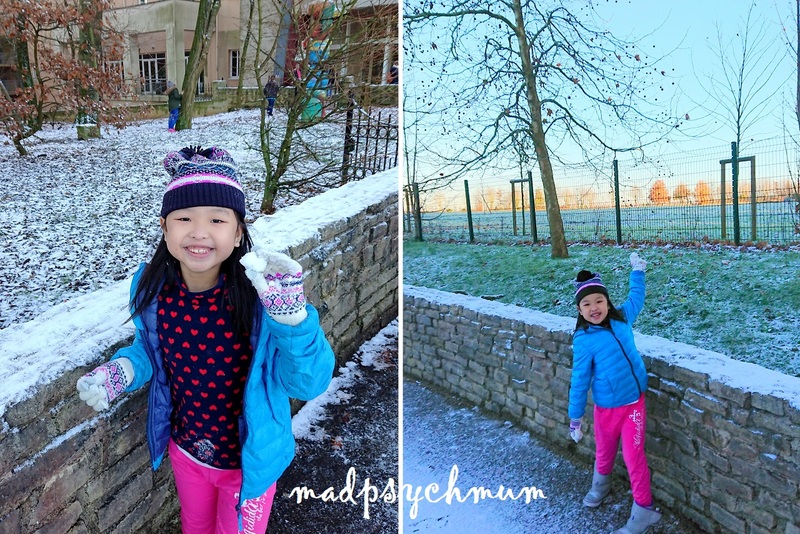 One of the girl's wishes for this trip was to make a snow man and snow angels but unfortunately, there wasn't enough snow to do that. She'd just have to make do with playing with whatever snow that was available. 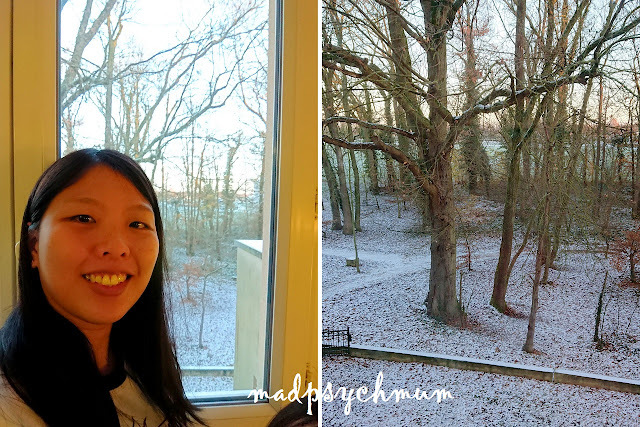 Super excited that she got to see snow for the first time throughout this whole trip! My girl had really wanted to swim at the awesome Water Playground in our hotel (see our previous post for more details) but she will just have to settle with playing in the snow since I'd rather not have to pack wet swim suits into our luggage. Too bad that it was time for us to leave! To catch our 2.30pm plane, we had to check out by 11am. We booked a taxi from the hotel and the list price on the counter clearly stated that it would cost €85 (so expensive!). The taxi was the same size as the one we took to Explorers Hotel from Paris City. We arrived at Charles De Gaulle Airport (CDG) after about 30 minutes. When we arrived, we had expected to pay €85 but the taxi driver claimed that it was €100! I really don't believe it was so expensive but the hubby paid anyway because we had no proof it was not €100! Such a shady driver! The first thing we did on arrival at the airport was to do our tax refunds. Thank God we arrived early because the tax refund took almost an hour, the longest it ever took me!!!! I know Parisians are not known for their efficiency but to experience it first hand was quite the, how shall I put it, experience. Even though I was warned that it would also take a long time to process tax refunds in Heathrow, I didn't experience anything like that (you can read my experience here). At least the person who verified the goods and stamped the receipts was the same person who issued the refund, making the process a lot smoother. In CDG Airport, however, the customs officer who verified the goods and stamped the receipts was different from the person who issued the refund. Hence, if the former did not stamp the receipts properly, the latter will ask you to go back and get it stamped again. I went back and forth between both counters (and queues!) at least THREE TIMES until I was so upset and frustrated! One of the officers had to help me get the stamps correctly while I waited at the counter, still hopping mad that the process was so inefficient. When I finally got my refund, in US dollars, I was so relieved that we could finally check in and clear immigration. This is hopefully my last time at CDG Airport! I'll rather go through Heathrow any time! After we finally passed customs, we got ourselves some food with our leftover Euros. 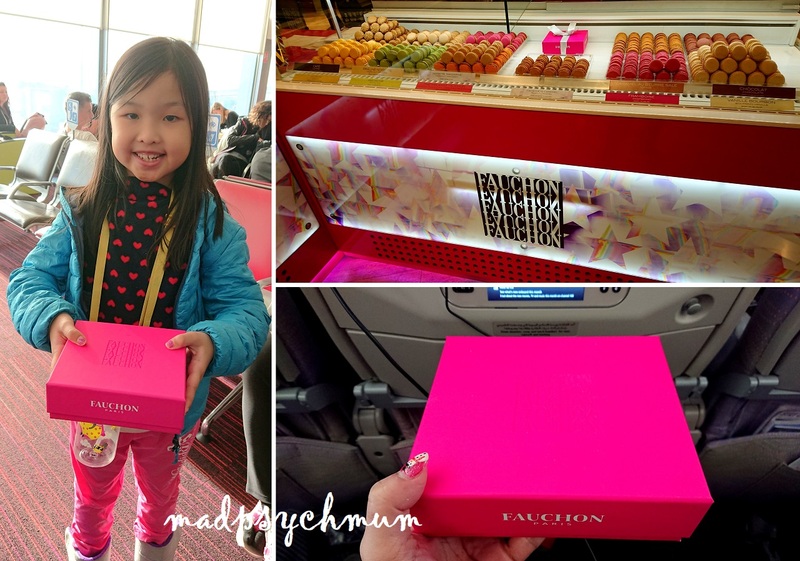 I bought us a box of really awesome macarons because French macarons are truly the best in the world! We finally boarded our plane and departed Paris at 2.25pm. The flight from Paris to Dubai International Airport took approximately 7 hours and we arrive at about 12.25am (Dubai time). As our flight was on time, we had to spend the full 3 hours in transit. It felt like a really long time because there was nothing much to do in the airport. We spent most of our time shopping and eating. It was finally time to depart Dubai Airport and fly back home. We arrived at Changi International Airport at 2.40pm (Singapore time) after travelling for another 7 hours 25 minutes. To be absolutely honest, we will definitely be back to the UK! I've always loved London and now have grown to love Scotland as well! The food and scenery in Scotland was so amazing! The UK definitely ranks top three of my favourite countries to visit! (If you must know, the other two are Japan and Australia). Paris, however, was horrendous in comparison. Even though Paris was indeed beautiful and the food was incredibly delicious, the overall experience we had just scarred our impression of the city. Beautiful as it was, the city was too expensive in my opinion and not as friendly for tourists.